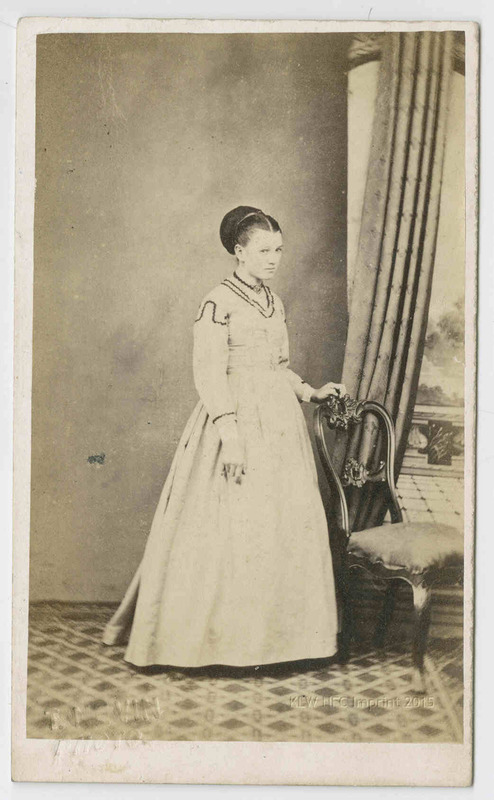 Although this image is faint – it is a scan of a print pasted into the scrapbook of his son George – it shows clearly enough that George’s father, photographer Thomas J. Nevin, was rather fond of his big box tabletop stereograph viewer. 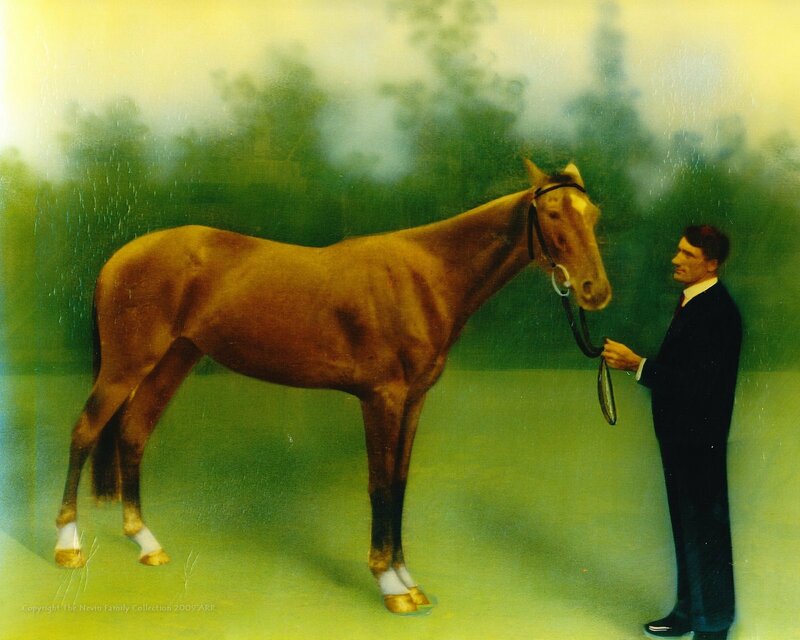 From © The Shelverton Collection 2007 -2009 ARR. 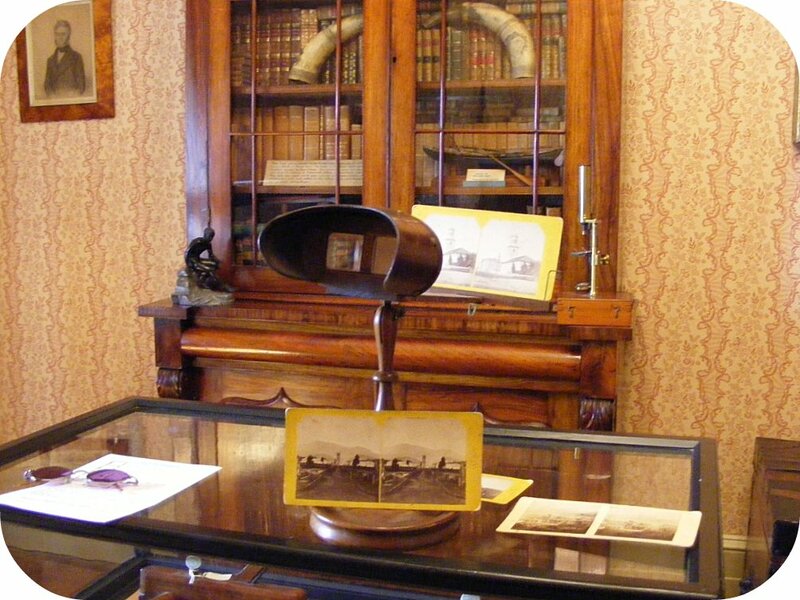 The stereoscope provided clientele with a ready amusement, a novel experience of 3D. 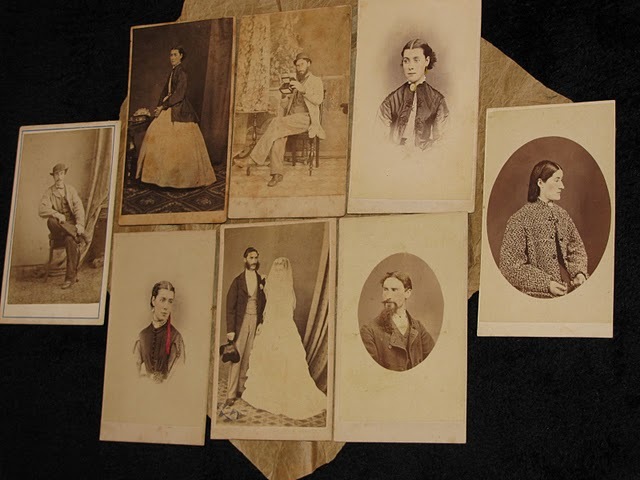 The Victorian fascination with this “advanced” photography is quite understandable. 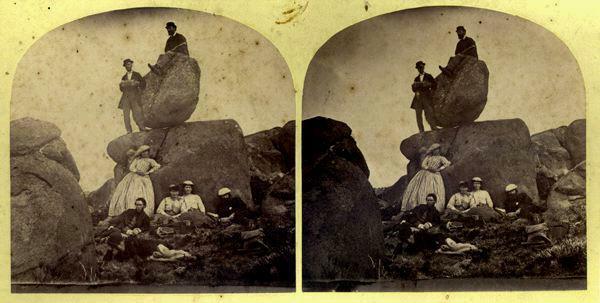 Viewing a static stereograph, three images can be seen, not just one: the central image appears in deep perspective, with the image split into halves on either side. A double lens stereograph viewer of this size could hold a large number of stereocards; turning the wooden handle changed the card being viewed, providing a motion picture effect. In Nevin’ self-portrait (probably taken by his younger brother Jack Nevin), a frame holder on top is propped up. In these other two portraits, the holder is flat. In all three extant carte-de-visite photographs of this apparatus, it sits on the very distinctive occasional table with griffin-shaped legs pictured in many of Nevin’s portraits of both his own family members and of commercial patrons. 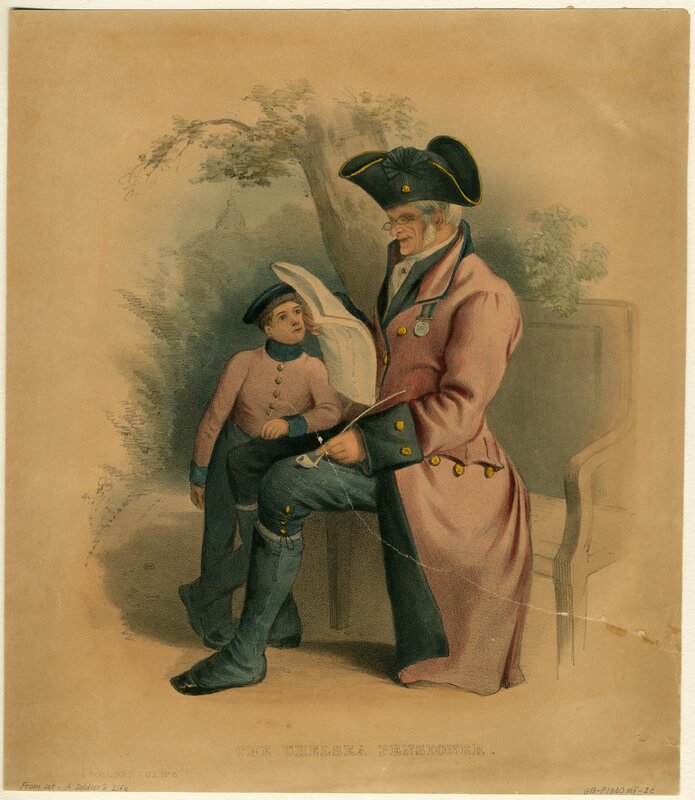 The two photographs (below) in which the men are standing in almost identical poses, may have been commissioned. 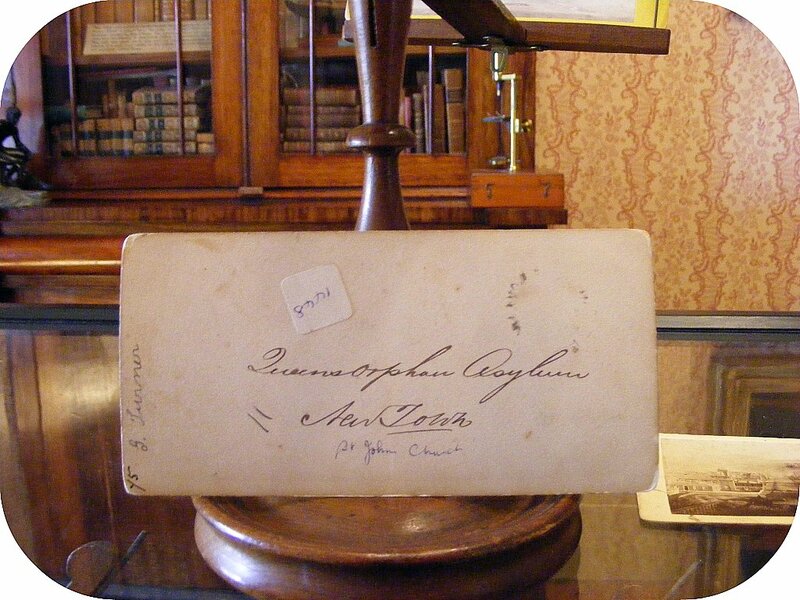 The first, this ineptly daubed carte of a young man with dreamy eyes and hand resting lightly on the wooden handle, bears Nevin’s government stamp on verso. 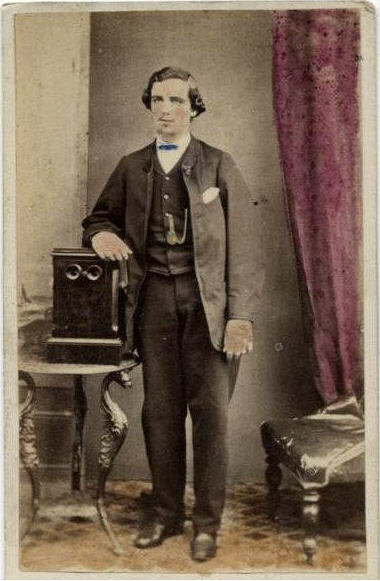 Portrait of young man with stereoscope by Thomas Nevin ca. 1874. Verso of T.J. Nevin incorporating the government insignia of lion and unicorn rampant. Scans courtesy of © The Private Collection of John and Robyn McCullagh 2006 -2009. ARR. 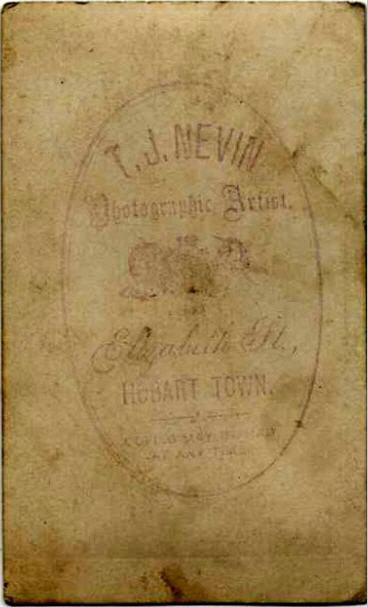 The hand-tinting is not the work of Nevin; it was done by subsequent owners of the carte and shares provenance with similarly daubed cartes (Northern Tasmania). 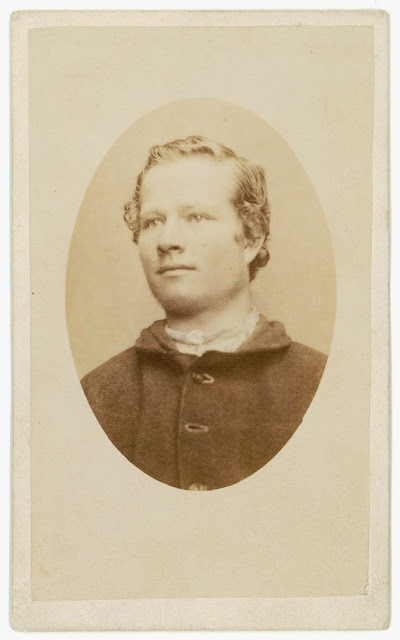 The young man pictured here may have been a camera worker, one of Nevin’s studio assistants working with both Samuel Clifford and Nevin who produced between them hundreds of scenic stereographs during the late 1860s and early 1870s. They also produced views of Hobart buildings on government tender. 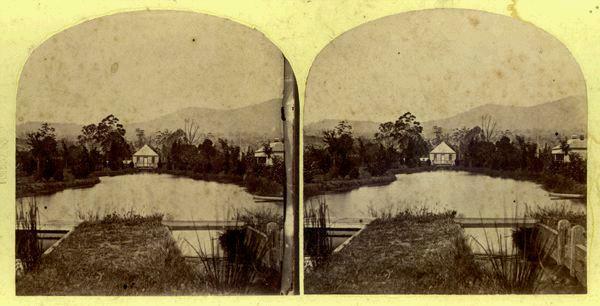 Several of their stereographs held at the Narryna Heritage Museum, Battery Point, Hobart depict an exterior view of Government House in Campbell St, The Queens Orphan School at New Town, and The Hobart Gaol viewed from Bathurst St.
Narryna Museum, Battery Point, Hobart. Photos copyright © KLW NFC & The Nevin Family Collection 2007-2009 ARR. 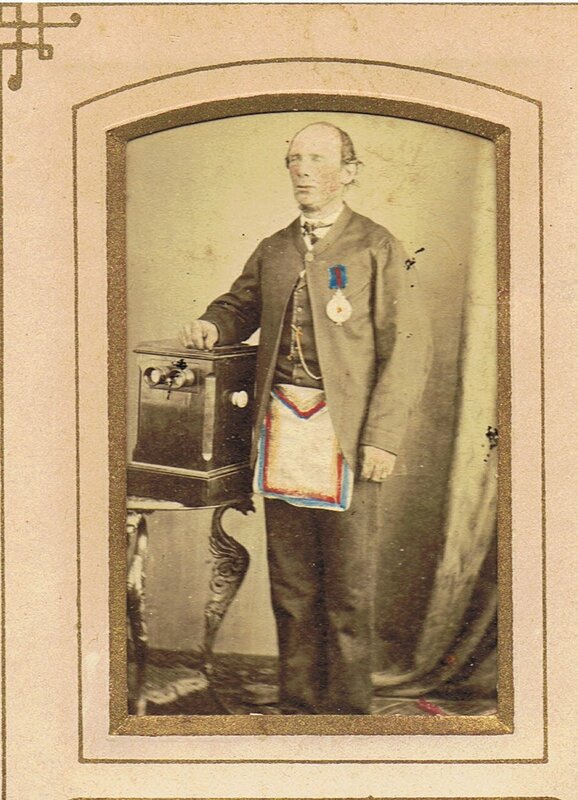 It is possible that this hand-tinted photograph (below) of a man wearing an apron and large medal on his lapel, which was also taken in Nevin’ studio, was commissioned, either to foreground the man’s religious affiliations as a Freemason, Templar or Loya United Brothers Lodge member (as was Nevin), or as an adjunct to a commission by the man’s Church organisation for a series of stereographs featuring the organisation’s buildings and gravestones. 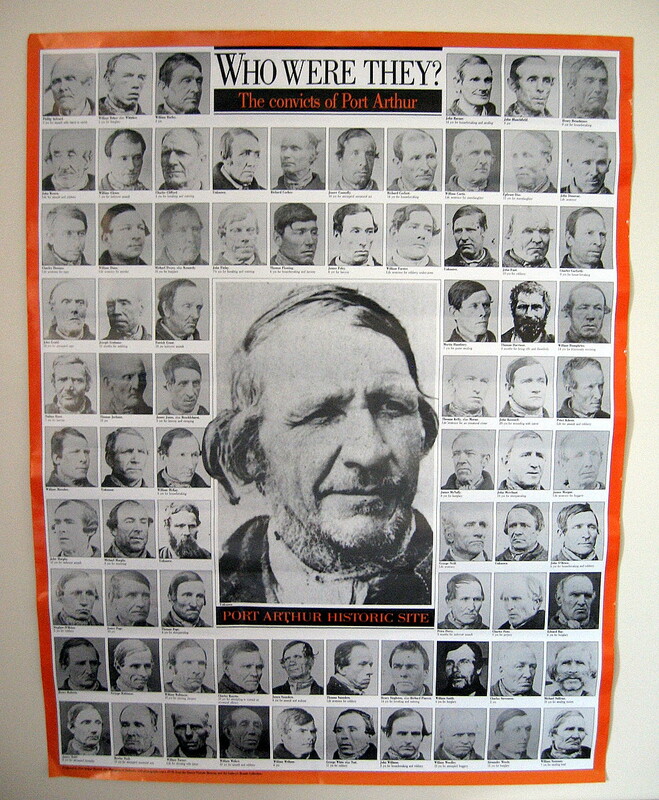 Nevin used the wording “Tombstones, Cheap!” on his advertisements pasted as a label on albums prepared for clients (see the list from the TMAG database). 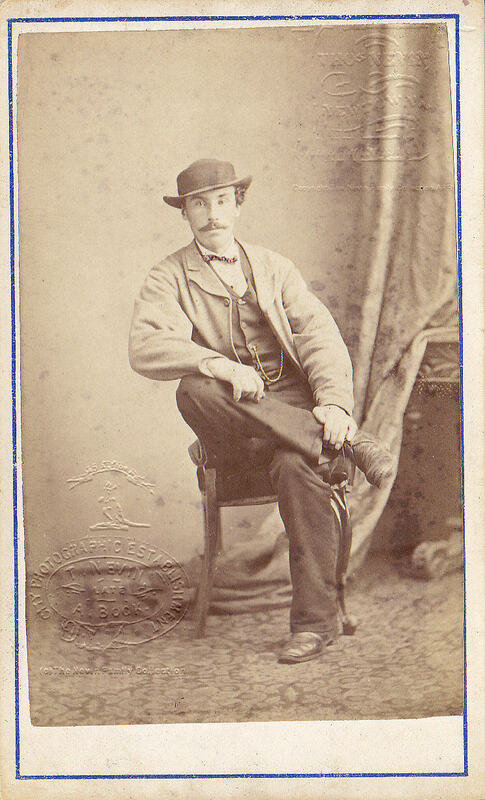 This older man’s pose is very similar to the young man’s pose next to the stereograph viewer. 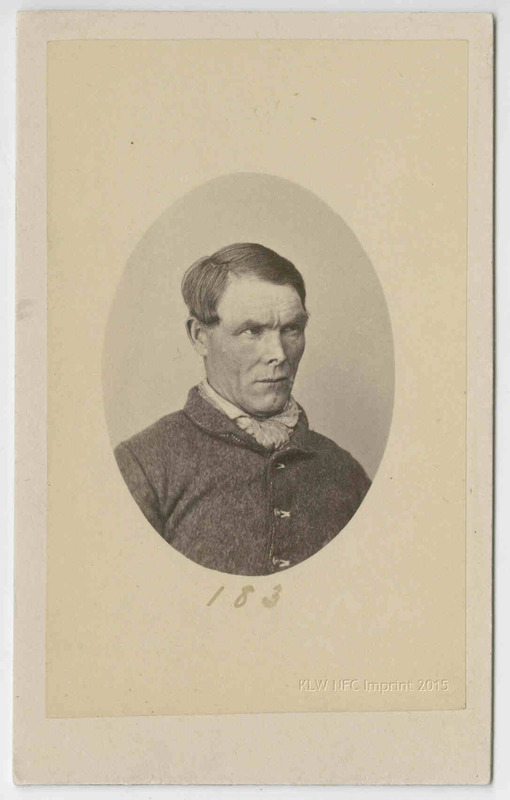 However, there is a subtle difference: in the photograph of the young man, the wooden handle is under his right hand. In this photograph of the older man, the wooden handle is on the other side of the apparatus, and underneath this older man’s right hand is a big white knob. The white knob, rather than the handle, appears to be under Nevin’s hand too in his self-portrait standing next to the apparatus. 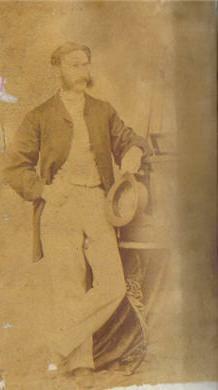 The bright red and blue tinting on the apron and medal ribbon in this photograph may signify more than a desire for heightened refrangibility, a depth of field effect which red and blue produced in 1860s stereography: it may signify the wearer to be a military pensioner who had arrived in Tasmania with a British Regiment, and/or member of the English Freemasons (rather than Scottish or Irish) who became established in Hobart from the 1840s. Although the apron is not tasselled or embroidered with motifs, as some are, the medal he wears is very imposing and may testify to his seniority and long service. He may have belonged to same Lodge as Thomas Nevin, the Loyal United Brothers Lodge. See this article for details. This carte is framed by the decorative cut-out borders of a cardboard album page, exactly as it was positioned there 150 years ago. wearing an apron and large lapel medal. posed next to Nevin’s tabletop stereograph viewer. Verso is blank.